Nanoloop one is a sequencer / synthesizer cart for the original Game Boy models. Current version is 1.7. Software can be updated with the optional USB-MIDI adaptor accessory. Nanoloop can run in sync with other devices. The USB-MIDI adaptor not just allows to sync to a PC and update the nanoloop software, but also to install two additional 32k ROMs on the cart. The program to start can be selected by simply pressing A or B instaed of START on startup. Only a few ROMs are that small, for example mGB and Shitwave, commercial games and bigger ROMs like LSDj don't fit on the cart. You may also develop your own software and put it on the cart, for example with the Game Boy Development Kit. 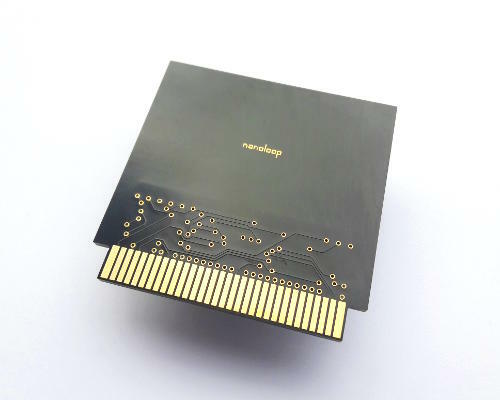 Instead of the typical PCB in a plastic shell, nanoloop one is a single PCB with all electronic parts embedded. Parts inside are surrounded by the PCB, so that only the golden pins are visible and the cart appears as one flat, solid piece. Despite its thickness of only 2 mm, the cart is extremely robust, thanks to the epoxy / glass fiber fabric composite PCB material. The cart fits firmly into the game slot of DMG, GBP, GBC and GBA. On GBA SP, its sharp edges stick out on the bottom. Program code and data share a single flash memory with a write-protected boot sector. The flash chip has a minimum data retention of 20 years and 100,000 write cycles.